Keeping your marine batteries in perfect condition will require a suitable marine battery charger. They are available in a range of different sizes with an onboard charger being the most popular choice due to its convenience and efficiency. 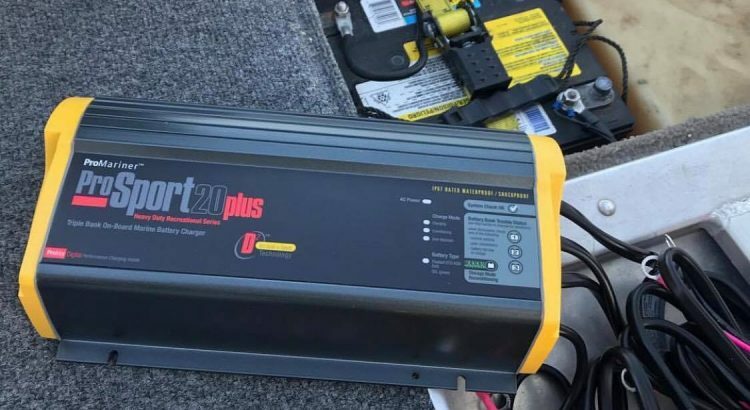 The best marine battery charger is the ProMariner ProSport 20 that uses 100% of the charging amps and automatically distributes charge among all the batteries. Even if you have the best marine battery possible, with the lack of maintenance they can become problematic. Most marine battery chargers come with several modes that not only charge but also act as a maintainer and can be used for desulfation. The size of the marine battery charger is dependent upon the type and size of your battery. Other factors are just as important, such as whether your boat is docked for long periods or it is connected to shore power. The marine battery charger needs to match the sum of DC load and another 10% of the amp-hour capacity of the battery. Whether you choose an onboard or portable charger, most come with additional features that help condition the battery. This is a feature that is worth paying the extra for as it will improve the capacity and overall lifespan of the battery. Below is a list of the best marine battery chargers that are suited for the marine environment and ensure your batteries are kept fully charged. ProMariner are a reputable marine brand produce a range of electrical products and have are known for excellent build quality. The ProSport 20 is the most popular onboard marine charger that they offer, which delivers fast charging. The ProSport 20+ will fully charge batteries in a respectable 8 to 10 hours and is compatible with flooded, gel, AGM and HP AGM batteries. It also has dedicated charging types that can be selected depending upon the battery you are charging. The Distributed On Demand technology used in this marine battery charger ensures 100% of the available charging amps are fully utilized. This is advanced technology that not many cheaper alternatives will be able to carry out. 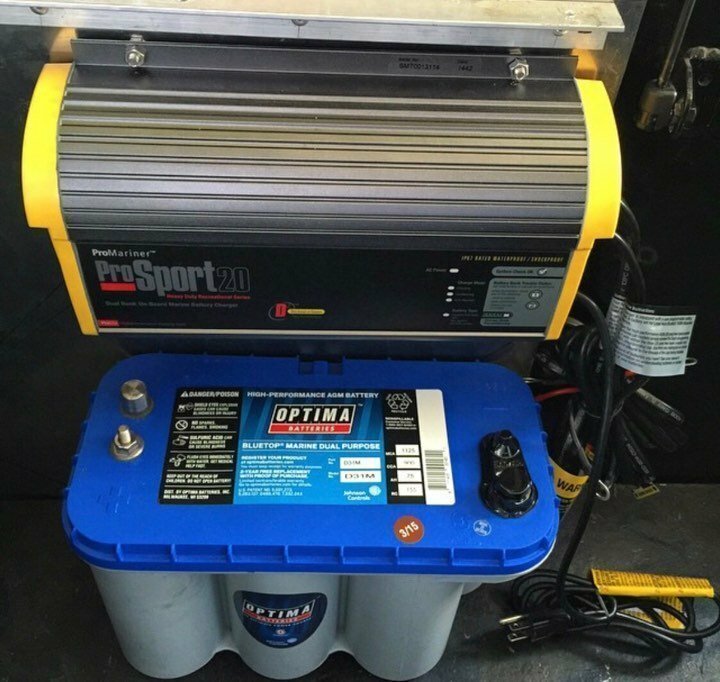 Overall, the ProMariner ProSport 20+ is the best onboard marine battery charger that has sophisticated technology to ensure the batteries health are not effected and it is charged efficiently. The NOCO Genius brand have taken both the marine and automotive world by storm with their battery technology. Their onboard marine battery charger comes in a range of forms with multiple banks for those charging more than one battery. Unlike many of the alternatives, the NOCO Genius also provides recovery and optimization benefits. It stabilizes the internal battery to restore lost performance as well as tackling batteries that are suffering from sulfation or lost capacity. Overall, it is a high performance marine battery charger and one of the best options. The ProSport alternative has slightly better technology and options but the NOCO Genius is far cheaper and has more charger options. MinnKota are an established brand that are known for their trolling motors and have great knowledge regarding marine electrics. Their onboard marine battery charger is designed to efficiently and safely charge batteries but it does come at a cost. One of the main components of this trolling motor battery charger include a digital microprocessor. The purpose of this technology is to protect your battery, provide twice as fast charging in high temperatures, short circuit protection, reverse polarity and ignition corrosion and so much more. Overall, it is the best trolling motor battery charger with the backing of the leading brand when it comes to trolling motors. It is more expensive but there is no other alternative that comes close when it comes to trolling motors. The Schumacher SSC-1500A-CA Ship ‘N’ Shore 15 Amp SpeedCharge is a portable marine battery charger that is lightweight and has a retractable handle for easy portability. Not every boat is able to have an onboard charger, which makes portable devices very popular. The unique selling point of the Schumacher SSC-1500A-CA Ship ‘N’ Shore is that it can be taken wherever you wish. It is the best portable marine battery charger for the money and it will easily restore your battery to full charge. For those that want a relatively cheaper alternative than the other onboard marine chargers within this article, the Marinco ChargePro is a great option. Overall, the Marinco ChargePro is a refined and quiet marine battery charger that will maintain batteries automatically. It is similarly priced to the other onboard battery chargers and has a range of different amperage to choose from. Ensuring that your marine battery is kept topped up so that it can function at its best is fairly important. You can opt to use a marine solar panel but of course, you are not always guaranteed to have sun to provide power to your battery. There are many cheap chargers around that will work but they do not feature the latest technology or features that improve the efficiency. Such features include automatic charging that stops when the battery is fully charged, battery desulfation and recovery and so much more. Other factors to consider is the fact that there are many types that include more amperage and the choice of a portable or onboard marine battery charger. To help you make an informed buying decision, we have produced the below buying guide. For smaller boats that simply do not require an onboard charger, the portable examples such as the Schumacher charger are ideal. However, they are not as powerful or refined as the onboard alternatives, which can be installed almost anywhere inside or “onboard” the boat. Larger boats require bigger and more batteries to keep all the electronics and starting of the engine fully functioning. Investing into one of the recommended marine battery chargers above ensure the battery is always at the optimum amount of charge. Boat batteries comes in a range of types with the main types being flooded (also known as wet), gel and AGM batteries. Each require certain charging modes in order to charge safely and efficiently. Some are very sensitive to overcharging and it is therefore vital that there is automation. Wet batteries are the best at handling overcharging because they are not sealed but they do require maintenance during the off-season. A maintenance mode features found on many chargers such as the ProSport is ideal for charging wet batteries. The most popular marine battery is the AGM type as they are maintenance free and survive shocks and vibrations better. The charger you choose for AGM batteries should have automation that prevents overcharging and is temperature sensitive. Finally, Gel batteries are the most expensive to purchase due to their build quality but require accurate charging that is regulated often. The Marinco ChargePro would be ideal for charging gel batteries safely. The majority of people will own or know someone with a car battery charger and it may be tempting to use that instead in order to save money. However, this is certainly something you want to avoid as it can cause expensive damage. In short, car chargers can cause current corrosion and are not built to the high standard of a marine battery charger that meets UL standards. Unlike automotive batteries, the marine alternative are designed for both starting the boat and powering the electrics onboard. There are so many differences to consider, so be sure to use a marine charger and not an automotive. When choosing the marine battery charger, you will notice that there is a variation of sizes, amperage and banks. If you own a relatively large vessel with many batteries, a charger with the same amount of bank as batteries would be required. The majority of chargers will have 5 to 10 amps per bank but as a rule of thumb, he boat battery charger needs to match the sum of DC loads and another 10% of the amp-hour capacity of the battery. The majority of marine battery chargers rely solely on shore power for their battery charging requirements. This is perfectly fine when docked up but if you were out to sea and the batteries run out of charge, what can you do? Using a powerful marine inverter is the best way to charge your batteries when out to sea. They have multiple outputs such as 12V DC, 120V AC and so much more. Due to the fact that battery banks are becoming far larger and technology is becoming more expensive, you will want to ensure you have a quality charger. You may be tempted to use a car charger but as discussed in this article, they can cause expensive damage. All of the marine battery charger devices within this article suit a range of budgets and feature both portable and onboard chargers. Hopefully you have a bit more knowledge to help you make the correct buying decision for your requirements.